My Beauty “Experiment”: Mirror, Mirror on the Wall, Who Has the Grayest Hair of All? Published: . Filed Under: Book Club. 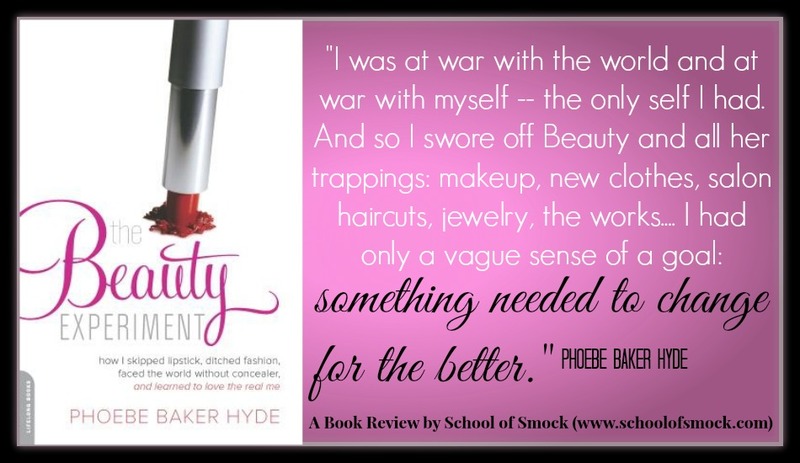 When I was asked to review The Beauty Experiment: How I Skipped Lipstick, Ditched Fashion, Faced the World without Concealer, and Learned to Love the Real Me by Phoebe Baker Hyde, I read about some of the exercises that the author suggested for reviewers to try along with reading the book. Then I laughed smugly. Eliminating beauty crutches and not looking in the mirror to check my appearance? This was going to be so easy, I thought. The memoir itself, this woman’s story, fascinated me; I particularly liked the way it was structured, switching between scenes of her life several years ago in Hong Kong, her present life in the U.S., and her own research and survey results about women and their appearance. But attempting my own beauty experiment? As a mom of a toddler whose daily wardrobe consists of leggings and yoga pants (many with holes), fleece hoodies, and Uggs, I figured this would be about the most effortless experiment that I’ve ever undertaken. (Sort of like the vow that I made to myself during pregnancy to eat ice cream every evening….) I’ve put on makeup probably about twice during the entire Obama administration, and the only thing that I do to style my hair is wash it and comb it. I hate wearing jewelry and only wear my wedding ring. I’ve gone weeks before realizing that I haven’t plucked or shaved a single hair on my body. It wasn’t always like that. After college, in my first jobs as an editorial assistant and researcher and then as a teacher, I used makeup to make me look older and more professional. It became a mask that I put on every day so that I wouldn’t be mistaken for a high school kid. For Phoebe Baker Hyde, getting to that place of not spending much emotional or physical time on appearance was a much more difficult process. She was at a very vulnerable point in her life — a new mom living abroad in Hong Kong (away from her family and friends) with a husband who worked long hours and traveled frequently. I could relate to so much of that. When my son was a few months old, we moved from Cambridge, MA (where I had lived for over a decade) to Buffalo, my husband’s hometown where I knew no one besides my in-laws. I hadn’t yet finished my dissertation. While my husband loved his new job and was feeling fulfilled professionally, I felt adrift and depressed about what I was going to do with myself. For me, those feelings manifested themselves in a lot of anxiety and moodiness as well as insomnia. For Hyde, she sought refuge in buying a fancy dress or picking up the latest skin treatment or lipstick. When those crutches no longer worked, she did something radical to change her relationship to beauty standards and her feeling of being at war with herself: stop using makeup and jewelry, buying new clothes, getting salon haircuts. Even one of her friends astutely tells Hyde, “This strikes me as being more about your marriage, or motherhood, or work issues than just your appearance.” And this experiment was about all of those things, as well as one woman’s relationship to her own body. And it turns out that I’m not so immune to societal messages — and the voices within my own head — about how women should look and age. Shortly after receiving the book I had an appointment at the salon, a new salon where it took weeks to book an appointment. I had already planned to cut my hair short. I did this every few years, and I was growing tired of my toddler pulling on my hair and trying to rip out my ponytail holders. Normally I get my hair colored as well with my very infrequent hair appointments. (Or sometimes I colored it at home.) I didn’t care about the color; I didn’t want fancy highlights or treatments. The only thing that I was interested in doing was covering my grays. I only colored my hair a few times a year, just when the grays would become visible enough that it started to make me anxious. That’s it! I realized when I got the confirmation call for my appointment. That’s my beauty crutch! I do not want anyone to see my roots. When I do look in the mirror, the first thing I look at is the part of my hair, where I know all my grays are. When I see them, especially in the sun, they truly upset me. I hate them. I know I’ve been blessed so far as a brunette in terms of finding gray hairs. (Many people in my family get a lot of gray hair in their twenties.) It’s six months until my fortieth birthday and I only have gray hair in one place on my part. But it’s noticeable, probably not as noticeable as I think they are. I’ve starting realizing that I avoid cameras when my hair hasn’t been colored in a while. This book made me think about my anxiety over gray hair and where it comes from. In theory, I know that many women look quite fetching with gray hair. For me, I think gray hair represents something much bigger. It means that I’m getting old, middle-aged even. Well into my thirties, I was still being carded at liquor stores. When I was in graduate school, people often mistook me for an undergraduate. But with my big patch of gray hair… no one’s going to think I’m a college sophomore. Okay, maybe in this light, they’re hard to see. But I promise that they’re there! I’ve been tempted many times to buy a box of hair dye at the drug store since my appointment several weeks ago but stopped myself. I’m not entirely sure why. Maybe I’ll get used to my grays. I’m giving myself the time to think about it. I’m giving myself time to think about what those gray hair represent to me: an older version of myself. I’m not young anymore. I’m not old either, right? That should be okay, but it’s not. In my head I still picture myself as a 25 year old: no wrinkles, no gray hair, no c-section scar, no weird hairs on my chin. What started out as a fun read and a breezy “experiment” in trying to find a single beauty crutch that I still possessed turned out to make me think more deeply about my own lingering hangup and fears of aging. I encourage you — whether you’re a woman who can’t conceive of a trip to the grocery store with a full face of makeup or a new mom whose entire wardrobe is stained with puke — to read the book or to check out Phoebe Baker Hyde’s website and learn more about her experiment. You may not think about your next makeup or clothing purchase in the same way again. You and I are very similar in our approach to beauty. I wear very little makeup and rarely style my hair, and it’s for no other reason that I prefer a few extra minutes of sleep to spending time doing a beauty routine. And yet I probably have some hang ups that aren’t quite as noticeable, just like you. I’m 35 and haven’t seen a gray hair yet, but I think that will probably be a bit startling when I do start getting them, and I like the idea of letting that uncomfortableness sit with you until you’ve worked out what’s behind it. Thanks for taking the time to read and review! Each decade of my life seems to pose a new challenge of self-acceptance; but in each is a seed of mature growth. Right now I’m trying to get to peace with old injuries and the special care they require; knees, lower back, pelvic floor. One kegel at a time, right? Very interesting. I dread putting make-up on (and I’ve never been good at it), and very often go with out it. The exception is my concealer! I also would be quite uncomfortable not highlighting my hair (which I’m sure hides the gray, which I pretend is not there). Definitely an age related thing, more than vanity – I think. I’m going to check it out. Great review! Allie recently posted…My New Design! 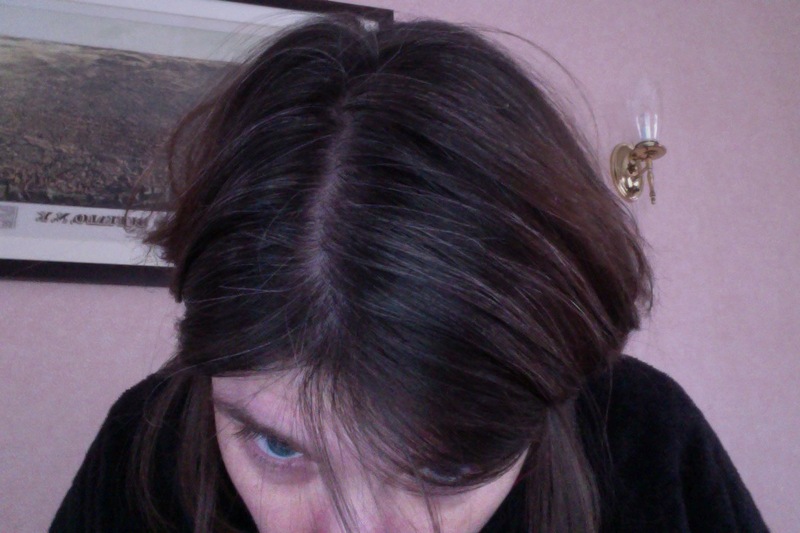 Okay, I have never once noticed gray hairs…. but I’ll believe you that they are there. I could never do this. EVER. Holy buckets, just being semi-makeup-less for a selfie is scary … let alone giving up my Estee Lauder, my hair appointment for foils, my nail polish …. a girl’s gotta have her indulgences! It’s something I enjoy doing, not something i do out of obligation or dread, so I’ll keep doing it. But applause for those of you who do this… I can’t imagine it! I heard about this book when the author was being interviewed on NPR. I was intrigued. Then I received the review request too. I really wanted to review this book and read the exercises over and over trying to figure out how I could make one of them work. I seriously considered taping my mirror, but didn’t think my husband would be too keen on it. In the end I decided not to participate. This is my busy time at work with lots of meetings and visitors and I knew I couldn’t go without my makeup. I have many beauty crutches, but am better than I was in my teens and 20’s. After I married my husband thought it was ludicrous when I wanted to shower and put make-up on before going to the grocery store. Now I just wear my glasses and hope no one recognizes me. When I was younger I used to think I was really ugly and my sister was cute. The funny thing is when I look at pictures of us now we look so much alike we could pass for twins. I love that you discovered something about yourself during the experiment. Makes me want to read the book. Also, it could lead to some interesting discussion on my blog. I find myself wearing make up less and less. The only time I absolutely always wear it is when I’m going on a job interview. Where ya been, lady? I’m similar to you on this front, although I definitely DO dye my hair. That is one thing I do. I’ve been going gray since age 21! Makeup – very little. Hair – nada (barely even brush it and when I do, people are like WOW, YOUR HAIR LOOKS AWESOME). Manicures – once in the last three years? Anyway, I wish I had a little more pizzazz (I think I used to) but I am also happy to be at that stage of my life where I don’t need to spend hours painting my face. What a terrific review, Jessica. Like you, I rock a wardrobe featuring yoga pants and Uggs and don’t think that much about how I submit to cultural standards of beauty. But your post made me think about the little ways I do (and, yes, dying my hair has recently become one of them). There’s a fine line between doing something because it makes us feel good and empowered and doing something because it’s what society tells us a woman should do. I know I’ll be thinking a lot today about where that line falls in my own life. Very interesting! I do admit that keeping my hair not gray feels like a part-time job. For real. I could probably use this book!